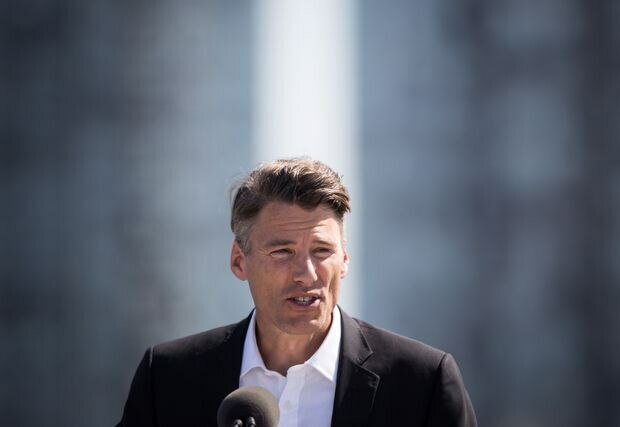 Vancouver Mayor Gregor Robertson speaks during a transit funding announcement in Surrey, B.C., on Sept. 4, 2018. Vancouver will see a record number of candidates competing for its city council, school board and park board, with 158 candidates for 27 positions. And there’s been a bump in several other cities as well, as limits to campaign donations and the sense that this is a “change” election have prompted many newcomers to run. Places such as Delta, the City of North Vancouver and Coquitlam are seeing more than a dozen people running for the six to eight council seats, and there are three to five candidates for mayor. Nanaimo has at least 20 council candidates and two would-be mayors, including NDP MLA Leonard Krog, vying to run a city that has been plagued by internal strife. Vancouver, a city that has been roiled by bitter debates over how to get the price of housing under control, has 21 candidates for mayor and 71 for council. While it’s not uncommon for one to two dozen people to run for mayor, that’s a dramatic increase in the number of council candidates, which typically number in the 30s and 40s. Civic elections throughout B.C. will be held Oct. 20, a month earlier than usual. The high numbers of candidates are likely due to the fact that so many councillors and mayors are not running again, say political experts. In Metro Vancouver, that "opened up people’s eyes,” said Simon Fraser University professor Patrick Smith. But the party that dominated city politics for a decade – Vision Vancouver under Mayor Gregor Robertson – will not have a mayoral candidate and won’t even run enough council candidates to get a majority. Vision went through turmoil last week after the party’s mayoral candidate, Ian Campbell, decided to withdraw just four days before the filing deadline on Friday. Two councillors, the departing Andrea Reimer and Heather Deal, who is running again, mused that they might jump into the race as the mayoral candidate. Ms. Reimer said she was concerned that the two independent candidates running with the aim of uniting the city’s four left-wing parties – former NDP MP Kennedy Stewart and environmental policy advocate Shauna Sylvester – would not succeed. “The internal polling is pretty clear: An independent can’t win, and there is too much at stake to not take that reality seriously,” she wrote in an e-mail last week. But by Friday, she had decided not to run. Instead, Vision officials issued a statement saying the party would consider endorsing one of the two independents, who are trying to appeal to voters from Vision, the Green Party, OneCity and the Coalition of Progressive Electors. There has been concern among some political observers and participants that there are so many new candidates and parties running that voters may stay away from the polls because they either don’t know there’s an election or will be so confused that they’ll be reluctant to vote. “If you don’t know a lot of the candidates, you’re probably going to vote for the people you know, or you decide to stay home,” said Prof. Smith. Campaign fundraising rules were changed for civic elections this year. Corporate and union donations are banned, and individuals can’t give more than $1,200 to a single candidate or party, a rule that is a disadvantage to those running with parties.